Buying frozen foods at the local fish store can get pretty expensive over time. Fish need varied diets, so rotating through separate foods each day of the week can be routine, but ask a person to do this for you while you are away and suddenly it seems overly complex. I'd read of others making their own food, and one member showed me his. Man, it was great! Not only did he save money, but he had all the foods mixed together so that every fish in his tank got what they needed each day. So here is how I make my food. Feel free to modify it to your own needs, and pass along the information to others if you feel it is helpful. Everything you see below is thrown into the food processor and chopped up finely, so that all the food is the same consistency. It is processed frozen, with no liquid added. Just chop it up into bite-sized portions, stopping from time to time to verify your progress. 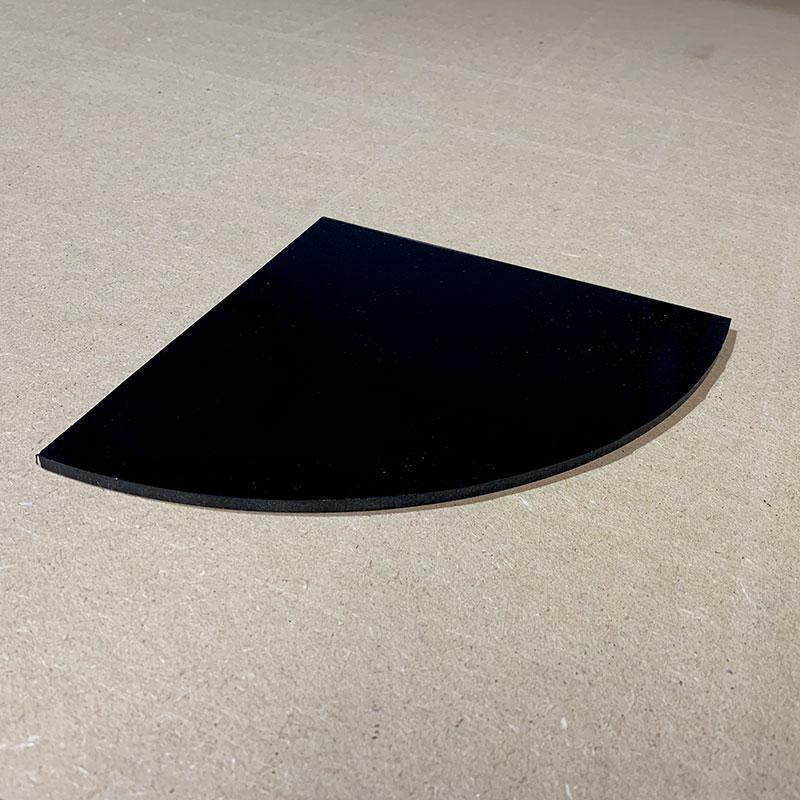 If the pieces are too large, your fish may not eat them and it will collect on your substrate, polluting the tank. You can prepare more coarse food for larger fish, finer food for smaller fish, and puree food for corals if you wish. Mark your packaging so you know which is which. During feeding time, you may opt to use various sizes so every create gets the appropriate mouthful, so to speak. The LFS (Local Fish Store) will have these and many other kinds of frozen food available. I like to mix them up to create variety. 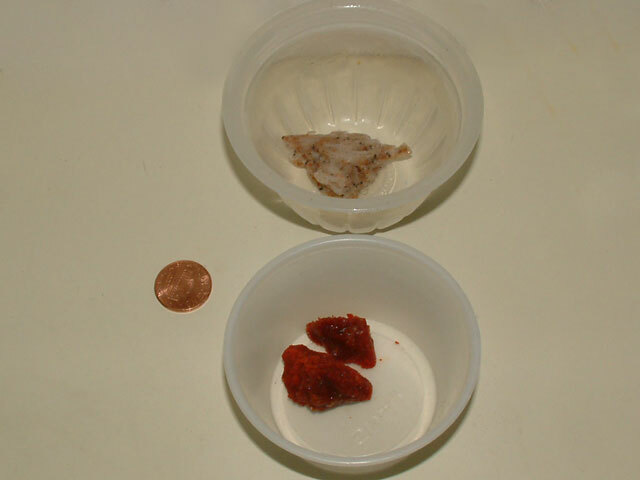 Take 12 cubes from each packet (or half a package) - Mysis, Daphnia, Plankton, Blood Worms, and Krill. 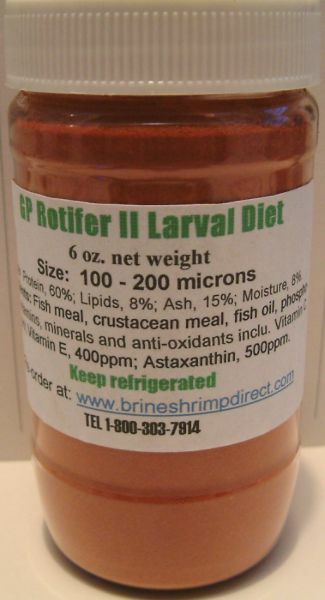 Spirulina Enriched Brine Shrimp is another good option. 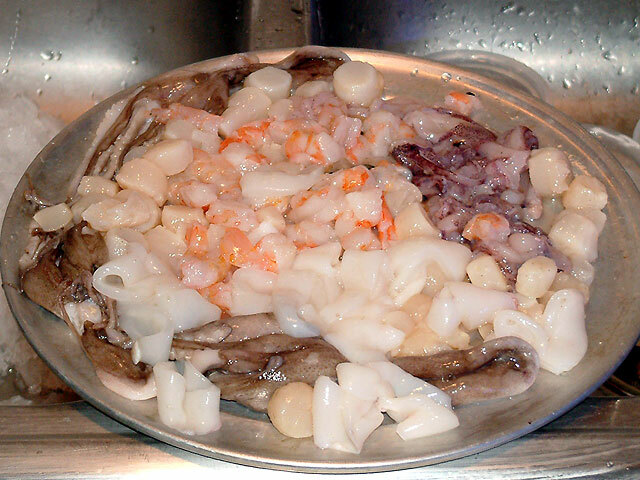 For a while I purchased fresh shellfish from a store that had a fish deli. The medley above was 1 lb for $10. This was frozen for a couple of hours, then processed into tiny bits. Fortunately, I found a cheaper alternative. 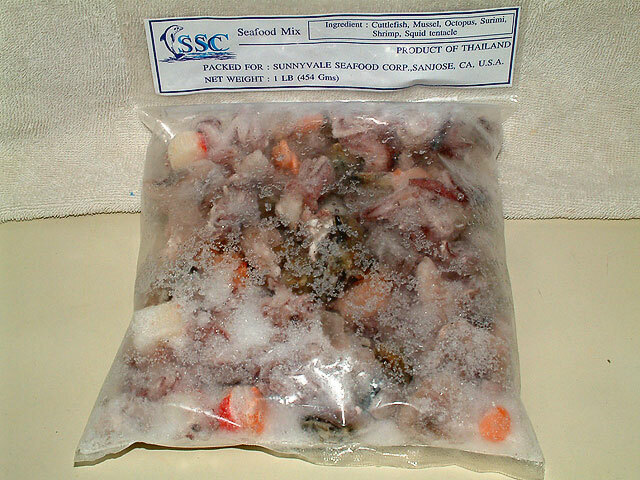 I purchased this bag containing frozen shrimp, squid, cuttlefish, mussel, and octopus, found in the frozen section of an asian market. At $3.50 for one pound, it was nice to save some money. This is processed into tiny bits, just as before. 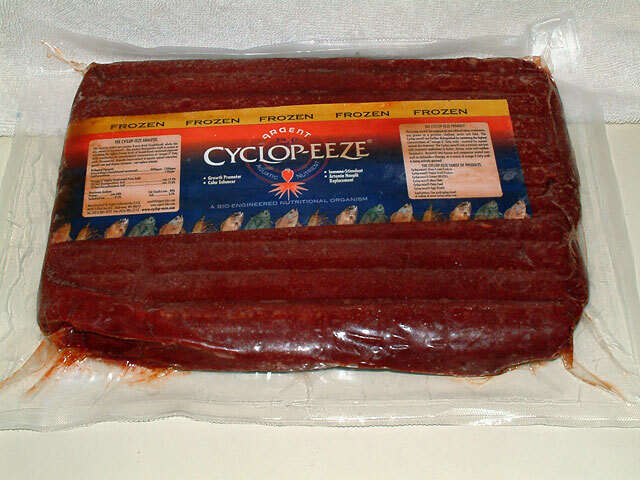 Cyclop-Eeze comes in larger bars as seen above, and comes in smaller portions too. I break off a section and add it to the mixture. Silversides are food that many use to feed their anemones. 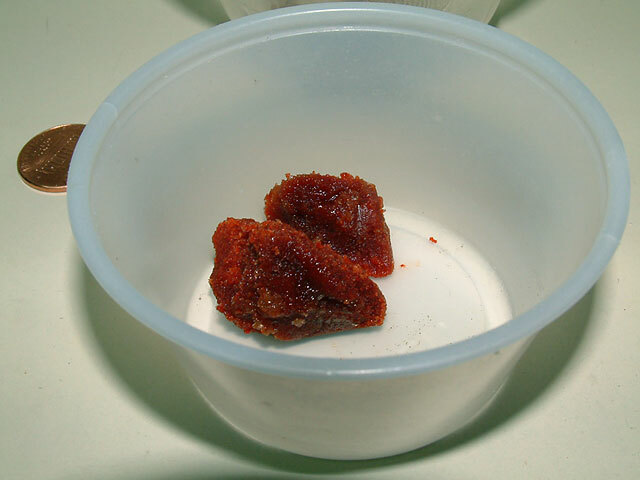 I found these larger fish, called 'smelt' at the asian market, and pureed them in the food mixture. My anemones* did not repond well to these fish, but my eels and fish don't mind. $2/lb. After they were frozen, chopping them up in the food processor was easy. 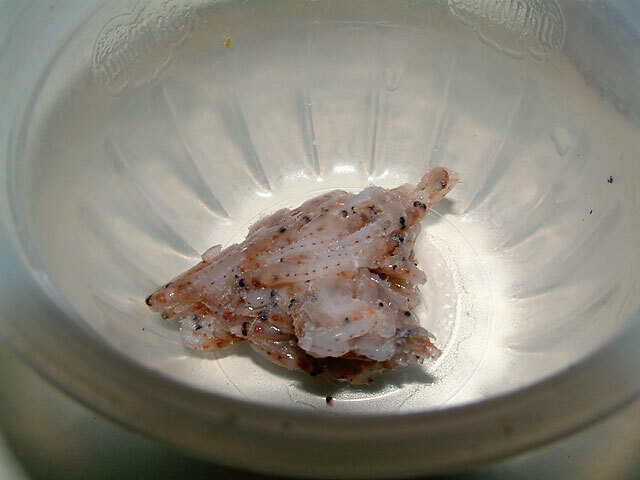 *Cut up a shrimp from the deli into five equal sized portions, and feed a few small pieces to your anemone every few days. You should only feed enough for the anemone to consume, but not so much that it expels the food later as a slimey blob. 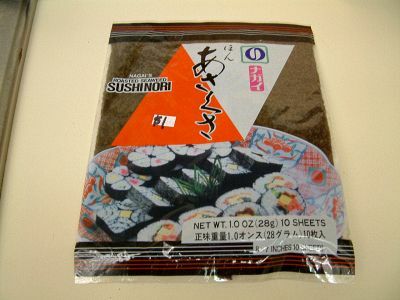 Nori - dried seaweed is available in the Oriental cooking section at the supermarket. 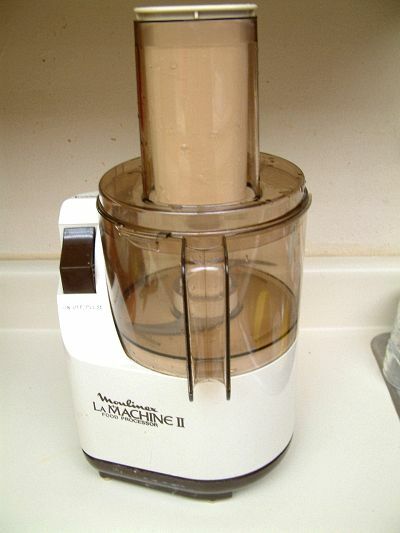 Tear up one or two sheets and toss this in the food processor as well. I also add a very small amount of Golden Pearls (three or four Salifert scoops) to my mix. Above on the right, a sample of the food is ready to add to the tanks. This sample is a tad watery, as it was the leftovers after packing the rest for freezing. The fish didn't seem to mind. 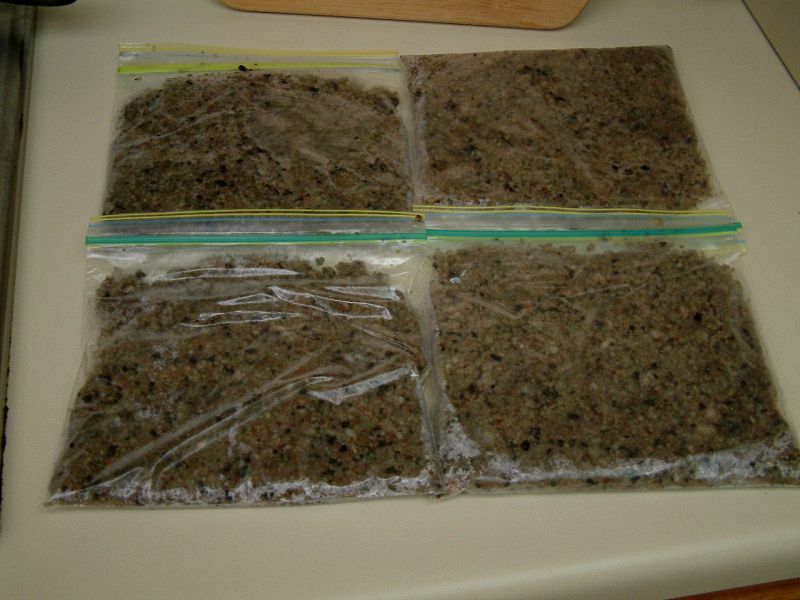 The food is scooped into separate ziplock bags that are pressed flat, and frozen. At feeding time, I break off a small piece and allow it to thaw. This amount of food feeds three tanks daily for more than a month. Serving sizes - How much should I feed? I would like to talk about food portions briefly, as some of these may not be foods you've used yet. Depending on the amount of livestock you have to feed, place a portion of food in a serving container. The top portion would feed my LPS corals in my 280g tank in one session. The bottom portion would be a good snack for my 25 fish, but not enough for a 24 hour period in my opinion. Admittedly, I spoil my fish with lots of food, and they are all very fat and happy. 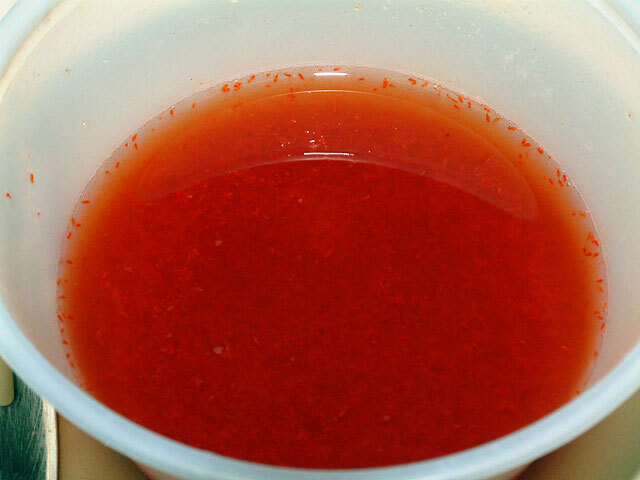 A small chunk of frozen Cyclop-Eeze is placed in a condiment serving cup. 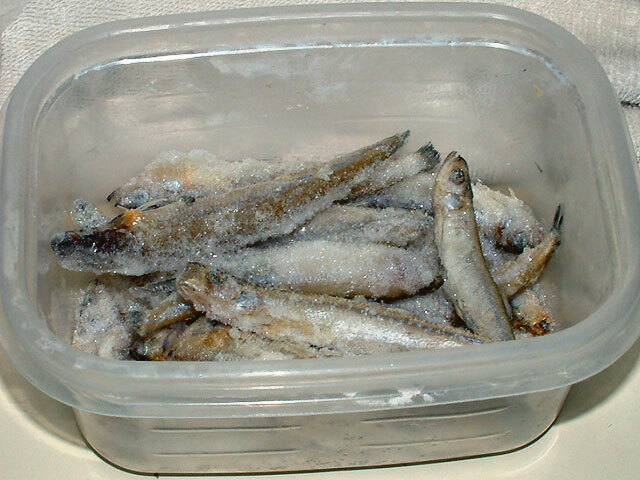 Next I dip this in my tank to submerge the food in tank water, which helps thaw it out. About ten minutes later, this is how much food there is, after stirring it with a fork. 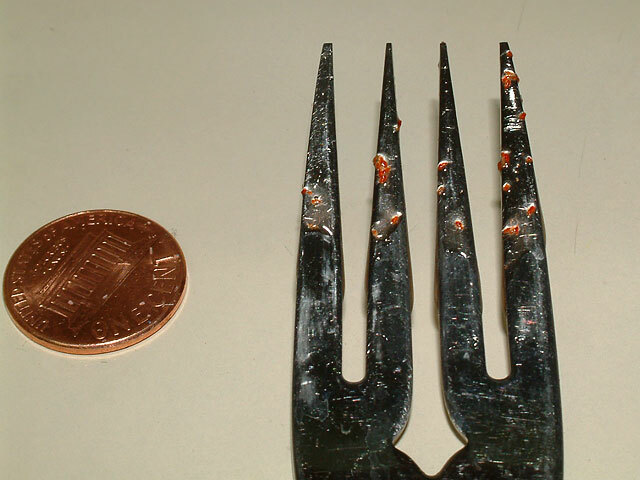 As you can see, the food is very small, so most any fish can easily consumer it. 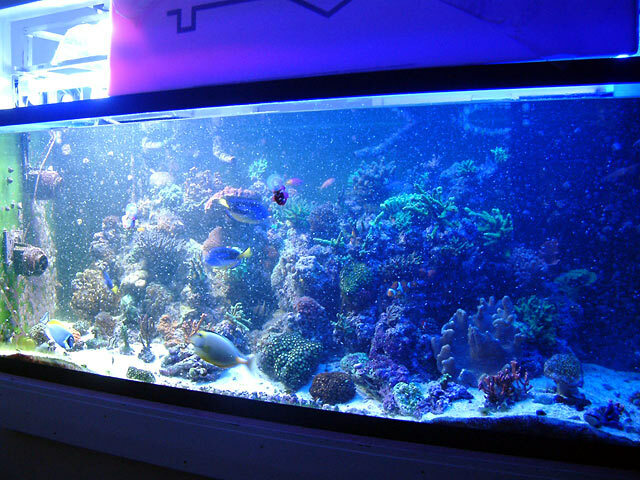 Some have observed their SPS corals trying to eat it, but for the most part it is food for fish and LPS corals. Another food is mysis that comes in a frozen block. 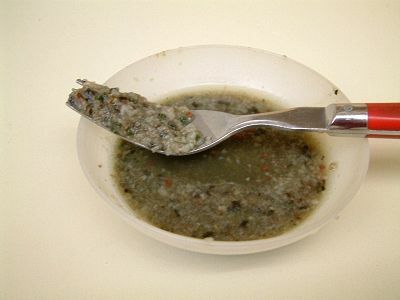 A portion is dropped into an individual serving cup (previously for applesauce). After adding 1/2" of tank water, it thawed out. As you can see that small chunk yielded quite a bit of food. 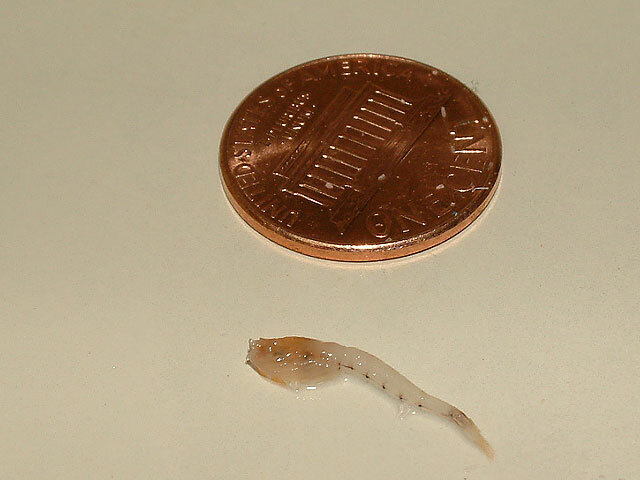 Here is the size of one mysis shrimp. 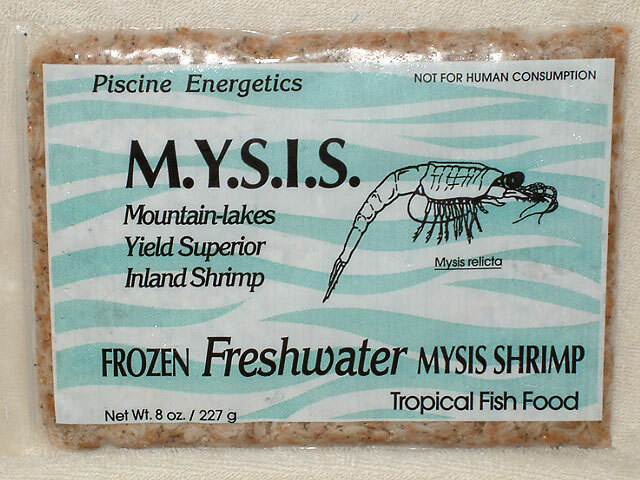 Mysis can be fed to LPS corals and fish. I feed my suncoral mysis every few days. Try to feed only as much as your livestock can consume in 5 minutes. Any more can add to the nutrient level of the water, and increase chances of nusiance algae growth. Finally, phytoplankton is dosed as a food for filter feeders. Squirting it at a coral or feather duster or clam typically is not a good method, as these animals tend to filterfeed over time and not just for a short time period. 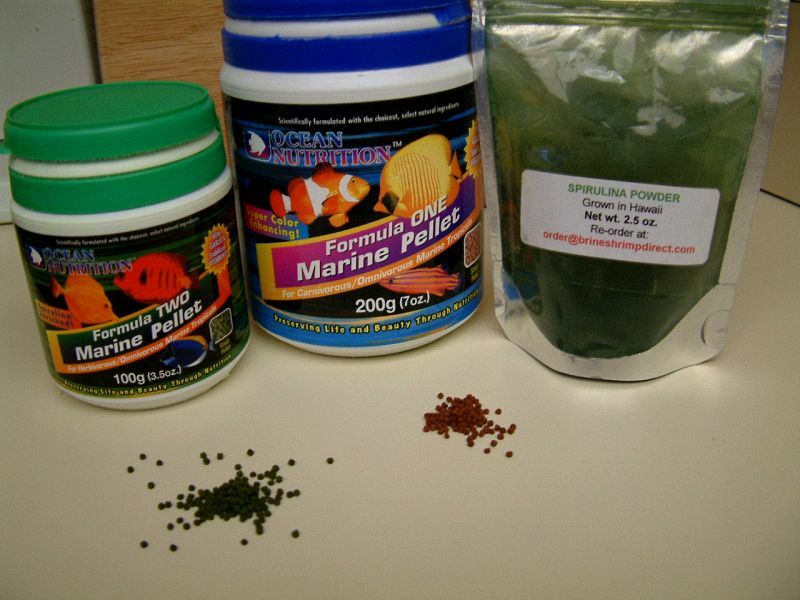 Below you can see a commercial product and a bottle of home grown phytoplankton. It should look dark green and smell clean. If it smells sour, it has spoiled. 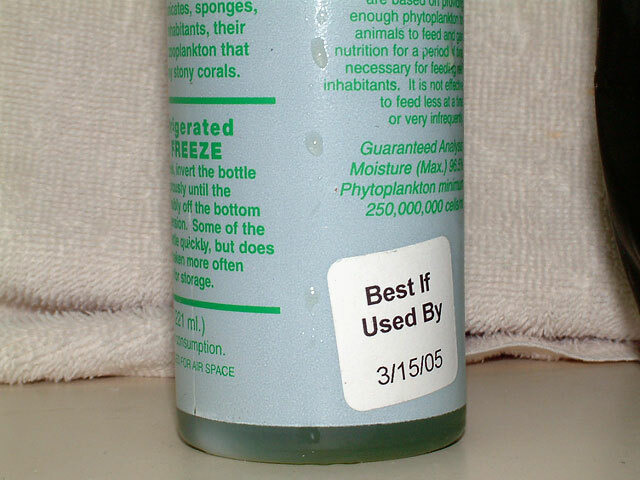 Refrigerated phtyo is good for a while, but check the expiration date on the commercial product. Home grown is good for about a month or so. 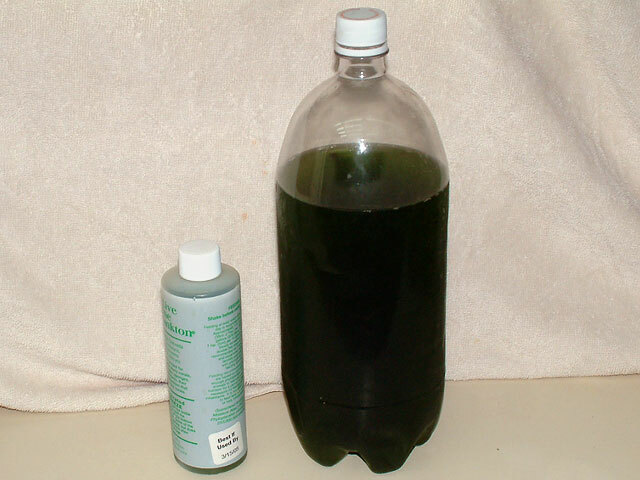 It needs to be shaken briefly once a day to keep the algae cells in suspension. If they settle to the bottom of the container, they will be smothered and die. Feeding phytoplankton every other day is beneficial to your clams, the pod population and soft corals, in my experience. If you have never fed it before, do not feed a full dose to your tank the first time. Feed 1/8th of the amount you should, then in two days feed 1/4 of the full amount, and two days later 1/2 the amount, and so on. Ramping up the dosing of this food prevents polluting the tank and allows the population and natural bacterial filtration to adjust to this new feeding routine. If you use DT's Live Phytoplankton, it will state how much you should use. With the home grown, you'll have to guesstimate, based on your total water volume and population density. 1 cup of home grown was enough for my 55g, if that helps at all. 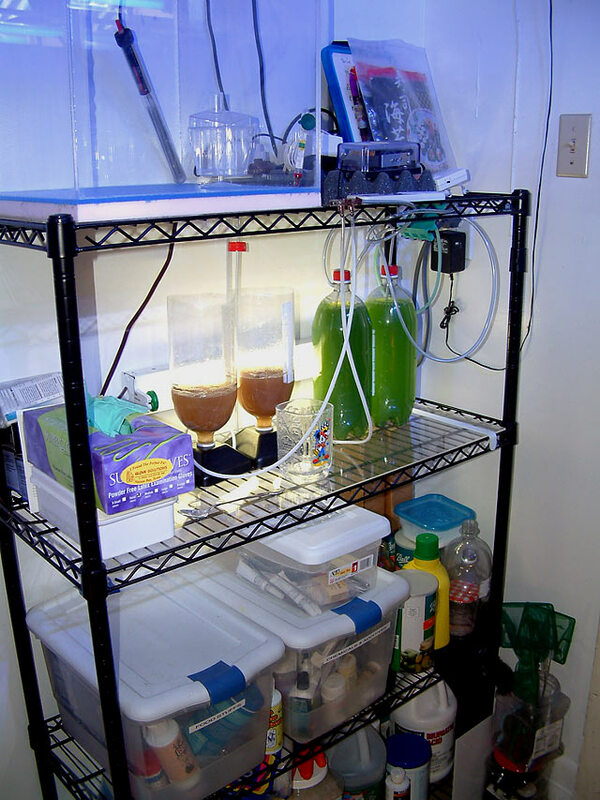 In this image, you can see how I grow phytoplankton myself, as well as baby brine shrimp. Due to the size of my tank, it makes more sense to grow my own live food and mix my own prepared foods to lower expenses. So what do I feed and how often do I feed it? Every couple of days, I clip half a sheet of Nori to the glass for the two tangs to eat. Within an hour or so, it is gone. I also put some pellet food in the Mandarin Diner each morning. 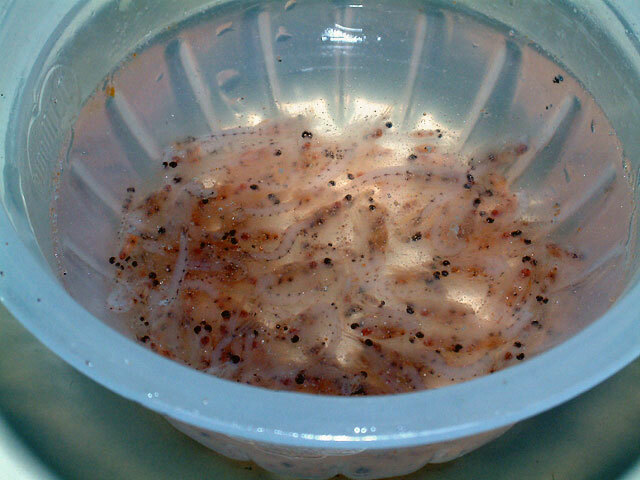 Later in the day or that evening, I feed the baby brine shrimp that I hatched 48 hours earlier (1 tsp of eggs per dose). Every night, I feed about 1/2 cup of the frozen recipe to my tank. And every other day, I pour in two cups of Phytoplankton, which may not even be enough but I try to avoid polluting the tank. Every time I feed the tank, the return pump is turned off to stop the food from going down to the sump & skimmer. Keeping the food in the tank allows the livestock to eat it and avoid excess detritus in the sump. This cloud of food was dropped into the tank, and 5 minutes later the water is almost clear again. Posted 2 hours 15 min ago.